Jungle vals (Vallisneria americana) also known as water celery, eelgrass and tape grass are a hardy, freshwater plant that are part of the tape-grasses family. It was one of the earliest aquatic plants used in the hobby, and remains very popular to this day. While its name seems to indicate that it’s indigenous to the Americas, its native range includes Asia, Australia, North America, Central America, and South America. In North America it’s primarily found in the east, though it has been spreading to the west in recent years, with reports of it in Washington, Arizona, New Mexico and Nebraska. Jungle vals prefer slow moving water, and it primarily inhabits lakes, ponds, and streams. It normally grows in shallow water, and it’s rarely found in depths greater than ten feet. It forms vast forests with its long ribbon leaves, which act as a refuge for numerous species of fish and invertebrates. It can also tolerate brackish water, and it is sometimes found in rivers and bays with variable levels of salinity. 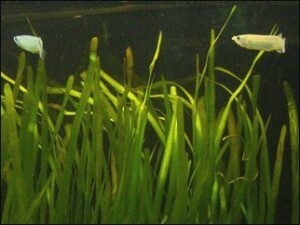 There are numerous species of Vallisneria in the aquarium trade and they can be very difficult to tell apart. While jungle vals (Vallisneria americana) tend to be the most commonly found, there are numerous other species which are often sold under incorrect names. Jungle vals grows completely submerged and root deeply in the substrate. It is commonly used in aquariums with fish known for digging, since its deep roots make it very difficult to dislocate. 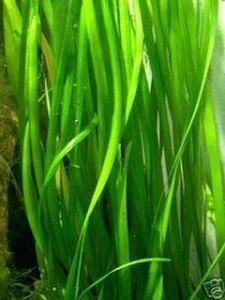 Because of its size, it should only be used as a background plant, and it can quickly overgrow a small aquarium. Jungle vals are incredibly hardy, and can adapt to most water conditions. With that being said, they are one of the few plants that prefer hard, alkaline water and may experience slower growth in soft, acidic water. They are also one of the few plants that can tolerate brackish water, though this will negatively impact their growth rate and propagation. When choosing a substrate, either gravel or sand are acceptable, though I highly recommend using CaribSea Eco-Complete . Plants grow lush and thick in a CaribSea Eco-Complete substrate and it provides both major and minor trace elements. It’s important to note that the crown of the plant must remain above the surface of substrate (the crown is lighter in color than the rest of the plant). This plant doesn’t require the addition of any CO2 to its aquarium, as they primarily exist in shallow water which is naturally poor in CO2. However, while no CO2 is required, they do benefit from the addition of an iron rich fertilizer. Fertilizer should be added to the tank water on a weekly basis, and it’s usually best to add it after a weekly water change. Jungles vals do best under high lighting, though they will adapt to moderate lighting – with significantly slowed growth rates. When choosing lighting for a jungle val, a high quality LED, or speciality plant bulb (CFL, Fluorescent Tube) are the best choices. The leaves should never be trimmed on this plant, and if the leaves are damaged in any way, they will usually just rot away and foul the water. If the leaves absolutely have to be trimmed, they should be trimmed with very sharp scissors. The leaf will sometimes survive this type of trimming without dying off. Jungle vals reproduces through runners in the home aquarium, which will root, and then form a new plant. The runners must not be separated from the main plant until the leaves have become fully developed. It can then safely be moved and replanted elsewhere in the aquarium. It often takes up to four weeks for the plant to acclimatize to being relocated and begin growing again. Jungles vals rarely reproduce through seeds indoor, and it usually only occurs in ponds or its natural habitat. During reproduction, white female flowers grow to the surface of the water, while smaller male flowers release from the plant and float to the surface. There they will be caught by the female flowers, and pollination will occur. Fertilization creates a long cylindrical pod, which is filled with tiny seeds. Jungle vals are the perfect plant for problem fish, and the combination of deep roots and tough leaves make them difficult for even the most aggressive fish to damage or uproot. They are good choices for cichlid and herbivore tanks, and while some fish will still be able to destroy them over time, they have a much better survival rate than most other aquatic plants.